You are currently browsing the tag archive for the ‘Organic Gardening’ tag. What are the best practices for you and your yard or garden? Below, organic gardening, sustainable agriculture and permaculture are discussed. They are similar to each other yet have key differences and are applicable in different scenarios. Mix and match the best of them to best suit your purposes. 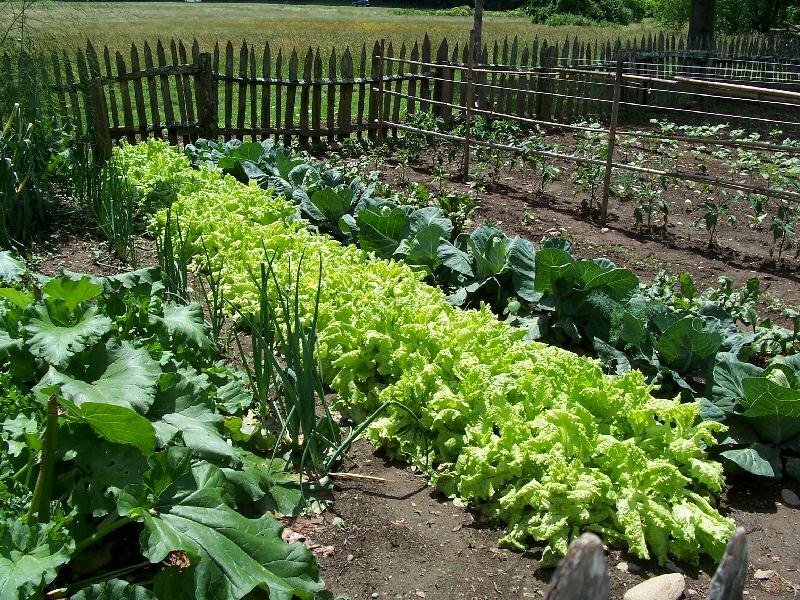 Organic gardening is a form of agriculture that relies on techniques such as crop rotation, green manure, compost, and biological pest control. Simply put organic gardening is growing food without the use of chemical pesticides, herbicides and inorganic fertilizers. It relies on the use of beneficial insects, diversity of plants, and the use of compost to supply the soil with nutrients. Organic gardeners don’t use synthetic fertilizers or pesticides on their plants. An organic gardener looks at plants as part of the whole system within nature that starts in the soil and includes the water supply, people, wildlife and even insects. An organic gardener strives to work in harmony with natural systems and to minimize and continually replenish any resources the garden consumes. Sustainable agriculture has been defined as an integrated system of plant and animal production practices having a site-specific application that will last over the long term. In simplest terms, sustainable agriculture is the production of food, fiber, or other plant or animal products using farming techniques that protect and conserve the environment, public health, human communities, and animal welfare. This form of agriculture enables healthy food to be produced without compromising the future generations’ ability to do the same. 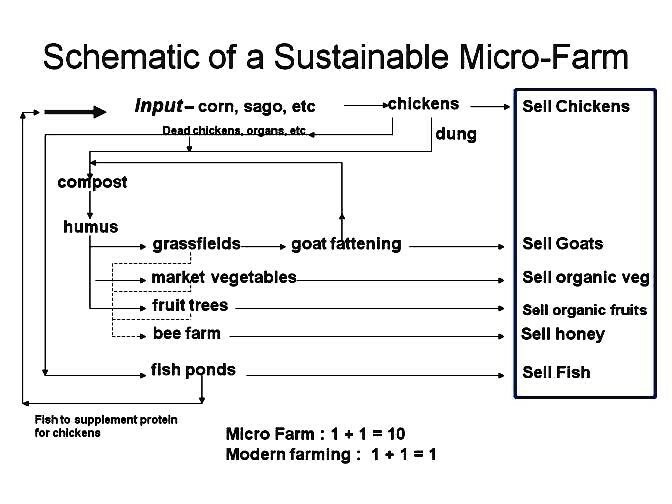 Model for a sustainable agricultural setup. A sustainable garden works in harmony with nature. There are many techniques that can improve the health of your garden and minimize any negative impact on the environment. Most are easy and will save you time in the long run. Sustainable gardening includes: organic gardening, double digging, worm composting, backyard composting, integrated pest management, and more. It is to cultivate in a way such that there are enough resources to live well and survive in a varied and flourishing environment for a long time. It involves using renewable resources properly. Permaculture, originally ‘Permanent Agriculture’, is often viewed as a set of gardening techniques, but it has in fact developed into a whole design philosophy and for some people a philosophy for life. It is more inclusive of everything, and is an entire way of living, not just gardening or growing things. The essential components of permaculture. Permaculture teaches us how to build natural, energy-efficient homes, build waste water treatment systems, use recycling techniques, grow our own food, raise our own animals (chickens, cows, pigs, bees, etc. ), restore diminished landscapes and ecosystems, catch rainwater, build communities, and much more. Its principles are constantly being developed and refined by people throughout the world in very different climates and cultural circumstances. Combining the best of natural landscaping and edible landscaping, permaculture aims for a site that sustains itself and the gardener. 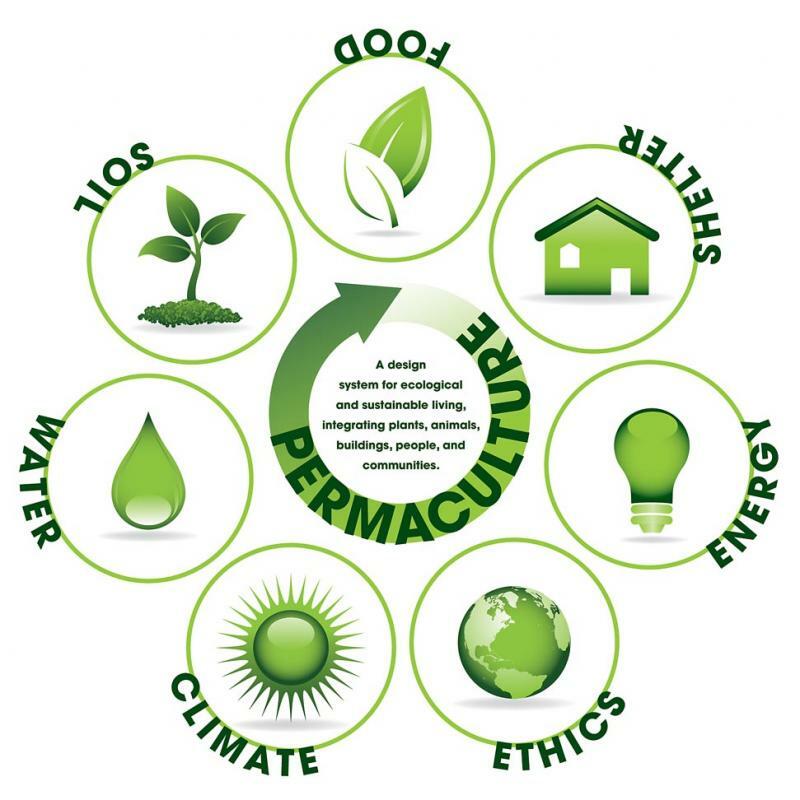 The purpose of permaculture could be to ultimately develop a site until it meets all the needs of its inhabitants, including food, shelter, fuel and entertainment. Permaculture emphasizes the use of native plants or those that are well adapted to the local area. As a gardener you will find your own way as you garden more, and try different and varied techniques. What works best for you may not work for someone else, so look around for ideas, try them, keep what works and toss out what doesn’t. The best thing is to try new techniques and have fun doing it! 1. Compost Your Lawn: Instead of reaching for the chemical fertilizers to feed your lawn, compost your lawn instead. It works better, is longer lasting, and it is fast and easy to do. Choosing to use fewer chemical-based products is always the better option. 2. Use Neem and Other Organic Sprays: Companies like Bayer and Ortho have brainwashed a lot people into thinking you need to bomb disease and pests with heavy duty chemicals to rid your houseplants or garden of your problems. Actually there is a nice balance that can be reached, and using more natural based sprays like neem oil, baking powder solutions and homemade organic sprays can go a long way. They may not always entirely rid your plant of the problem, but most plants, if given optimal growing conditions and nutrients, can still grow and be productive as long as the disease or pests are kept at bay. 3. Double-Digging: This means to dig out the first 12 inches (30 cm) of topsoil, take a portion of it for your compost pile, then dig down another 12 inches (30 cm). This aerates 24 inches (61 cm) of your soil, improving its texture and ability to absorb and drain water and nutrients. 4. Worm Composting: A plastic bin with holes can house a family of red wiggler worms, who will eat your kitchen waste (eliminating it from the city waste stream), and they will make it into good, odor-free compost. 5. Backyard Composting: Using a myriad of techniques, you can compost your yard waste, kitchen waste, and create nutrient rich organic matter to add back into your garden soil. Weeds are a problem every gardener has to face. Weeds are to gardeners as injuries are to sports people. Well, not quite but weeds are like an occupational hazard! And like most problems there are solutions, some of them not quite pleasant as the other. Taking that into account I would like to divulge the organic view of taking care of weeds. The bigger the weeds get the harder they are to control. They use up the nutrients and water that your plants need! So get into the habit of a once-a-week intruder patrol to cut down your weed problems. Using the right (organic of course) tools and techniques you will definitely cut down weed growth making it a manageable- maybe even enjoyable- task! The organic way requires diligent work and aren’t we all quite the buzzing bees in our gardens. The organic way will be very effective if carried out right. Here are ways to organically prevent or remove weeds from your garden. You should use a combination of the below techniques for best results. Mulch as you know is a layer of material applied to the surface of the soil. Yes, mulching inhibits growth of weeds by not allowing them enough light. And no light means no chlorophyll which in turn means no weeds! The weeds that do manage to get through the thick layer of mulch will be easily removable as their roots will be shallow. Of course you’re going to be using organic mulches -straw, grass clippings, leaves, shredded bark, sawdust, kitchen scraps- which will decompose in time to nourish the soil. This will serve as a fairly effective weed barrier. Use plenty of newspapers or kraft sheets (paper used to make grocery bags) or cardboards under the mulches, for even better weed protection. A 6-inch layer of shredded newspaper used at the start of one season allowed no more than 8 weeds per square yard to sprout for 2 seasons without renewing the mulch layer, in a study conducted at the University of Vermont back in 1992-1993. Weeds haven’t learnt much since then so I’m sure these results are still valid! Hoeing will work effectively when the weeds are still small and haven’t bloomed yet. Annual weeds die when their stems are severed from their roots just below the soil surface. With a sharp hoe you can easily cut those weeds down. For best results go for a swan neck or oscillating hoe instead of the traditional square-headed garden hoe and to avoid backaches hold it as you would a broom- with your thumbs pointed upward. Corn gluten is 100% natural. It is a byproduct of the wet-milling process and was accidentally discovered to be an effective weed controller. The awesome thing is that apart from suppressing growth of weeds, it will feed your garden as it is a source of nitrogen. Also it is not at all harmful to humans, animals or birds. Sounds too good to be true? Here’s the catch. It will prevent weed seeds from germinating roots, but once the weeds have gone beyond the sprout stage corn gluten will not affect them. Also, they cannot distinguish between weeds and crop seeds. So don’t use them where you have just planted other seeds. They are best used in established lawns or perennial garden beds. The sun can do wonders for you in the garden. Apart from the obvious it can help you get rid of persistent weeds if you leave your bed fallow for six weeks in the summer. Maybe you can try this on a small part of your garden. You don’t want to be out of action for so long. Start pulling, hoeing or raking out as many weeds from your garden bed sometime in late spring or early summer. Then wet the soil and cover it with plastic using weights or by burying the edges. Leave the plastic as it is for those six weeks. When you remove the plastic you will see the fruit of the sun. Rather you won’t see much as the sun will have cooked all the weeds that would have sprouted. Follow these methods persistently and there’s a good chance that in a few seasons you will have repelled these invaders for good! Compost is organic matter that has been decomposed and recycled. It is a simple way to add nutrient rich humus to fuel plant growth and replenish depleted soil. What more?! It’s free, good for the environment and is very simple. It doesn’t look or smell that great though! It should be a crime if you own a garden and don’t make your own compost! As a soil conditioner- Yeah! As good as all those chemicals with scary sounding names. Recycling of kitchen and yard waste-Instead of lazily getting rid of waste in a community dustbin a lot can be salvaged. Beneficial organisms are introduced to the soil-Those squeamish earthworms and bugs are actually quite good for your plants. Environment friendly-And how much we want to show that we’ve gone green! Reduction in landfill waste-A landfill is probably the second worse place you could go to, after hell of course! Several methods have been tried and tested. For producing small amounts of compost, trash cans or simple wire compost bins are great. For larger amounts, you could pile the waste matter in a secluded spot and composting will naturally take place. I’d say as much as you can. If space is issue, then using the pile method is not an option. Having several trash bins will solve the problem. Composting is an ongoing process so you can keep adding waste to your pile and remove decomposed product simultaneously. So there are two types of matter you’d be adding to your compost pile; the “greens” and the “browns”. The greens are rich in nitrogen or protein and the browns have a high content of carbohydrates. The greens are responsible for the heating up of the compost pile as it breaks down while the browns are the source of food for those yummy microbes that breakdown organic matter. You would definitely want to have more browns than greens in your compost mixture. An approximate ratio of 2 parts browns to 1 part greens should do. Also shredding all these materials into smaller bits is bountiful. Just makes it easier for them microbes! Happy composting! I’m sure most of us have made New Year resolutions (we know people who relish the whole experience). And more often than not, these resolutions become yet another of those things we wish we could do but never have the time or motivation. In true spirit of the new year, we’d like to add another one to your list. We compiled a small list of 10 reasons why you should plant an organic garden. If you already are an organic gardener, pat yourself on your back and read through 10 reasons why you are a happy person! 1. Exercise and the beautiful outdoors: We weren’t meant to sit indoors throughout the day. Organic gardening is a great way to get some exercise, unwind and give yourself a little time to not think about deadlines, presentations or the fleeting worries of daily life. Did we mention fresh air? 2. Healthy dinner table: Wouldn’t you love to tuck into a dinner without wondering where the vegetable came from and how they were grown? Not to mention the tons of pesticides and chemicals that were used to mass produce them. In your garden, you are the king! 3. Environmentally friendly: Nature is a delicate balance of a thousand different things. Mass production is causing a disequilibrium that has adverse effects on the food we grow. Use of pesticides and chemicals, wastage of water and depletion of soil fertility are a few of the things that can be prevented if more people adopt organic farming. 4. Tastier food: One of the most delightful aspects of organic gardening is the quality of food produced. The personal touch that one gives to the garden reflects in its produce. Organically grown vegetables are fresh, healthy and bursting with an array of flavors that will get you addicted (in a good way). 5. Make new friends: There’s one thing most people agree about; that you can never have too many friends. Just like any other activity, gardening gets you outdoors meeting new people. These people will have a variety of interests that will definitely add a new dimension to your life. One thing you can be sure about, gardeners are some of the friendliest and cheerful people you will meet! 6. Give your children a valuable lesson: Gone are the days when kids enjoy the simple pleasures that we grew up with. These days, everything needs a battery, chip and a bright display to capture their attention. Put away the iPods and the iPads and get out into the garden with the kids. Bonding over a session of gardening will be one of the most rewarding moments you will ever share with your child. Moreover, it will instill a valuable lesson in responsible living. 7. Conserving resources: The average American eats food that has traveled over a 1000 miles before it reaches the dinner-table. The fuel spent in transportation doesn’t just add to the cost, but has environmental implications as well. We believe it’s best to source local, eat local. All the better if it’s from the backyard! 8. Variety: Did you know that there are hundreds of varieties of tomatoes? (We actually have over 170 varieties of heirloom tomato seeds on our site alone!) Or, that there is a whole range of peppers to suit every palate and cuisine? One of the perks of organic gardening is the access that one acquires to a whole new world of vegetable varieties. Make every guest at your dinner party ask you for the recipe to your super-secret tomato sauce. And you could recommend our heirloom seeds while you’re at it :)! 9. Organically grown vegetables (and their plants) make perfect gifts: We’ve given you 8 good reasons why organic gardening is such a great activity. Sharing your produce is like paying it forward. There’s nothing better than giving a family member, friend or a neighbor the freshness of a first harvest. More often than not, you will be growing more than you consume. Your neighbor will love you :)! (And if you want a head start, check out our great selection of organically-grown vegetable plants!). 10. Save money: We won’t even talk about how, on a superficial level, organic gardening will help you save money. Think, instead, of hospital bills and realize that we can prevent rather than search for a cure. Good luck and our best wishes! Feel free to ask us if you have any questions. We’d love to hear from you. Oh! And in case we forgot to mention, share this with a family member, friend or neighbor who could do with some good cheer! Peppers are a good choice for backyard gardeners, there are so many varieties you can grow that you can’t find in the supermarket. There are a few tricks for growing peppers properly and getting the most out of your plants — so keep reading! One of biggest keys to success in organic gardening is the condition of the soil. There needs to be adequate organic matter to hold moisture and nutrients. And at the same time, the soil needs to be loose enough for good aeration and drainage, which will help promote strong root development. No other fruit says summer quite like sweet, juicy, thirst-quenching watermelon. It’s not only refreshing on a summer day, it is also packed with vitamin C, vitamin A, beta-carotene, and vitamin B, as well as some of the most powerful antioxidants in nature. Watermelon can take up precious space in the garden, but it’s worth it. My mouth is watering just thinking about it! There is nothing in the world like home-grown tomatoes right off the vine. And once you’ve tried them, you’ll never want to go back to store-bought. Tomato plants are relatively easy to grow too, with just a few tricks. Cantaloupe and honey dew are easy to grow with a few tips. Don’t plant too soon — wait until all frost danger is over — and keep them moist at all times. It’s very important that you don’t let them dry out during the hot part of the summer. Keeping them moist is the secret. One other tip: don’t plant cantaloupe in the same bed as your cucumbers. If you plant them too close to your cucumbers, they might cross and starting taking on the same flavor. In fact, plant up wind in you can. Welcome to our new organic gardening blog! Thank you for visiting our new blog, Organic Gardening News And Info. We are Kim Wilhelm and Bryan Jones of www.sweetcornorganicnursery.com,and we are big proponents of gardening organically. We are excited to post info, and build a dialogue on everything from current news and information related to gardening organically, gardening tips and how-tos, ideas and recipes for using your harvest, and more!